A political research firm with ties to President Trump reportedly accessed 50 million Facebook user accounts without authorization. 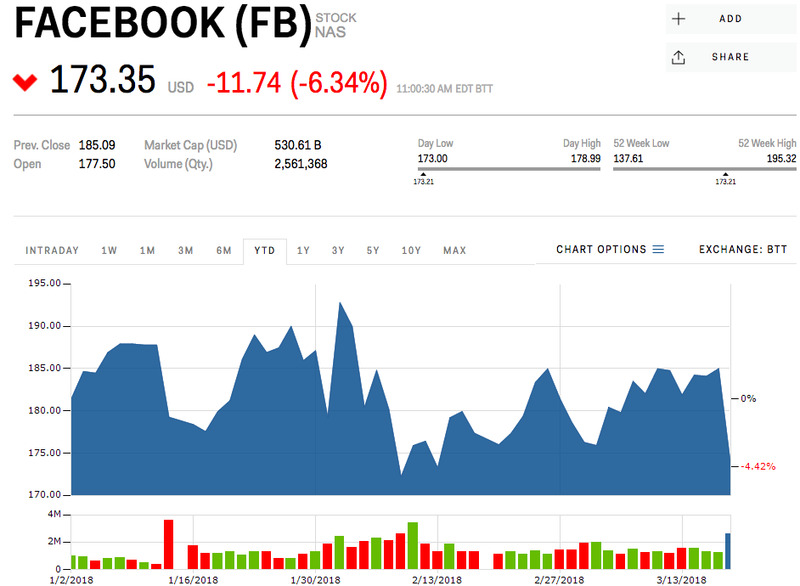 Facebook‘s stock is down more than 6% Monday. Macquarie analyst Ben Schachter said that the real concern for investors is that these breaches may prompt regulation that could hurt Facebook’s earnings. News of the breach comes as both Facebook and Snapchat are having broader issues with questionable content. Facebook shares are down more than 6% Monday on news of a massive data breach. The stock closed Friday at $US185 a share and is down to a low of $US173 Monday. News broke over the weekend that a political research company, Cambridge Analytica with ties to President Trump, had accessed 50 million Facebook user accounts without authorization. “The concern is that you’re opening a can of worms,” Macquarie analyst Ben Schachter told Business Insider. “Every time I see headlines like this,” he added, he gets “concerned.” The real long-term concern is that regulators might respond to news of the breach with onerous restrictions, said Schachter. “Investors are concerned about regulatory impacts on internet companies,” he said. “We haven’t seen actual laws that would change [earnings] numbers,” he said. And “the actual dollars and cents around political ads are not meaningful,” according to Schachter. Rather, investors are worried about the threat of what regulation can do companies largely dependant on ad dollars. And Unilever, a large conglomerate of consumers goods, threatened to pull its ad dollars from Facebook in February, citing the social media giant’s need to clean its content up. Facebook is down 4% year-to-date.